Why Get My Wisdom Teeth Removed? Where Can I Get My Wisdom Teeth Removed? Wisdom teeth (or third molars) are the last four teeth to erupt and generally come in during the late teen years or early twenties. The jaw is often too small to accommodate the new wisdom teeth comfortably, so their eruption often causes pain and requires removal. The cost of wisdom teeth removal will depend on the complexity of your treatment - the less complex, the more likely your wisdom teeth can be extracted in the chair, and the more affordable your treatment will be. So, how much does a wisdom tooth extraction cost? In Australia, wisdom tooth removal costs can reach up to from $500 per tooth, depending on the complexity of the treatment. According to the 2017 national dental fee survey, a simple removal using local anaesthetic for all four teeth can cost up to $2,322 in Australia. You can expect the cost of wisdom teeth removal under general anaesthetic in Australia to be higher as well, varying from $1,500 to $3,000 per tooth. With smile.com.au dental cover, you save up to 40% off the price of wisdom tooth extractions. Select your state in the cost comparison table below for more detailed examples of the cost of wisdom teeth removal in your location. Join smile.com.au and start saving on wisdom teeth removal today! At your consultation, your smile.com.au approved dentist will advise whether your wisdom teeth are fine or likely to cause problems. If your wisdom teeth are likely to be problematic, your dentist may recommend a surgical extraction. Your dentist will use local anaesthesia, sedation or general anaesthesia in order to numb your mouth and/or suppress your consciousness during the surgery. An incision will then be made in the gum to expose the tooth and bone. If any bone is blocking access to the root of the tooth, it will be removed. If the tooth is difficult to remove, it may be divided into several pieces before being removed. After that, the extraction site is cleaned and any remaining debris is removed. The site is stitched up if required for healing before gauze is placed over the site to control any bleeding and assist the formation of a blood clot. Depending on the size of your jaw and how your wisdom teeth develop, you may not experience any issues with your wisdom teeth. The best way to determine whether you require wisdom teeth removal or not is to visit a smile.com.au approved dentist for a professional evaluation and assessment. If your dentist detects an issue with your wisdom teeth, surgery may be recommended to have them removed and eliminate (or avoid) any uncomfortable symptoms. Early removal is generally the best option as it helps to avoid more serious issues in the future. If your wisdom teeth are correctly positioned in your mouth and not causing any pain or oral health problems, you may not need to have any removed. However, wisdom teeth can cause serious issues and severe pain. If a problem is detected with the development of your wisdom tooth, it is advised that you have it removed as soon as possible. The most common reasons for having your wisdom teeth removed include tooth decay, gum infection, pressure pain, othodontic reasons, prosthetic reasons, or cyst formation. It’s important to visit a well-trained, quality dentist for your wisdom teeth removal. By visiting a smile.com.au approved dentist, you are assured quality dental care and can save up to 40% off wisdom teeth removal by joining smile.com.au. With nearly 2,000 quality approved dentists across Australia, there’s sure to be one near you. Do I Need A Specialist To Remove My Wisdom Teeth? What Impacts the Cost of Wisdom Teeth Extractions? What Issues Are Caused By Wisdom Teeth? How Can I Prepare Before Removing My Wisdom Teeth? What Should I Ask My Dentist About My Wisdom Teeth Removal Treatment? What Are The Benefits Of Removing A Wisdom Tooth? What Are The Disadvantages Of Removing A Wisdom Tooth? Is it Painful to Remove Wisdom Teeth? Are There Home-Remedies To Alleviate Pain Before a Wisdom Tooth Removal? Are There Any Risks With Wisdom Teeth Removals? What Will Happen If I Don’t Get My Wisdom Teeth Removed? Are There Alternatives to Wisdom Teeth Removal? To have wisdom teeth removal covered, you will need to have a high level of extras cover. In some cases health insurance extras may cover wisdom teeth removal, for example if it is required due to an impacted tooth. Most extras cover policies include general dental treatments like small fillings, but do not include major dental procedures, like wisdom tooth extractions. No matter if you are covered or not with your extras policy, you can save up to 40% off wisdom teeth removals by joining smile.com.au and visiting an approved dentist. Generally, you do not need a specialist to remove your wisdom teeth. Most wisdom teeth removals can be performed by a general dentist, so many patients do not need to visit oral and maxillofacial surgeons. You may be referred to an oral surgeon if your case is very complex. 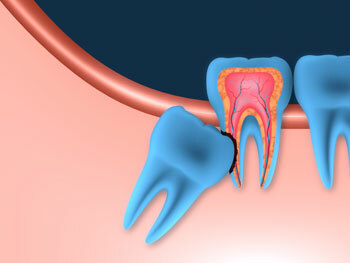 The duration of a wisdom tooth extraction depends on how many teeth need to be extracted. It can take up to an hour and a half to remove all four wisdom teeth. General anaesthetic is rarely necessary as most wisdom teeth extractions can be done in-chair. Your smile.com.au approved dentist will typically give you an injection of local anaesthetic to numb your tooth and the surrounding area. While you will be awake during the procedure and may experience some pressure, you should not feel any pain. You may also breathe in nitrous oxide to relax during the extraction. Alternatively, you can also receive sedation anaesthesia through an intravenous line in your arm. If your wisdom tooth extraction is more difficult or time consuming, the price of your treatment can be affected. You can choose to have your wisdom teeth removed by a dentist in the chair with local anaesthetic, or have the treatment performed while you’re asleep under general anaesthetic in hospital. It will cost more to have your teeth removed under general anaesthetic. Many people experience issues with their wisdom teeth. The most common problems caused by wisdom teeth include pain, damage to nearby teeth and teeth crowding. You may experience pain or swelling while your wisdom teeth grow in, or you may have no symptoms at all, even though your other teeth may be at risk of damage. This is why it is so important to have a wisdom tooth assessment performed by a professional dentist. There are several issues that can be caused by wisdom teeth, including: tooth decay, gum infection, pressure pain, or cyst formation. If your wisdom tooth is impacted, saliva, bacteria and food can accumulate around it. This causes decay to the wisdom tooth or the tooth beside it. This often leads to a painful infection. If your tooth has partially erupted through the gum, food particles and / or bacteria can accumulate beneath the gum which results in a local infection. This can lead to pain, swelling and bad breath. You may even find it difficult to chew or open your mouth fully. This infection can spread to the cheek and neck. When a wisdom tooth develops, it can cause a lot of pressure against the other teeth in the mouth as they try to make room. This can cause severe pressure pain and can even lead to erosion of the other teeth. If you have received orthodontic treatment to straighten your teeth, your wisdom teeth can compromise the results by moving your teeth out of place. When a patient requires dentures, they are advised to have any wisdom teeth removed. If a wisdom tooth grows in beneath a denture, it can lead to irritation. If it is then removed, the patient will require new dentures as this changes the shape of the gums and mouth. A cyst (fluid-filled sac) can form from the tissue surrounding an impacted wisdom tooth. This can lead to bone destruction, jaw enlargement and movement or decay of nearby teeth. The removal of the tooth and cyst is required to avoid further bone loss. Tumours can develop inside these cysts and they can even result in a fractured jaw if left to grow. It's best to arrange a lift home for after your surgery, as you won't be able to drive home after your procedure. Ask a friend or relative to accompany you to the dental clinic. It's important to ask your smile.com.au approved dentist whether you need to fast before your wisdom teeth removal treatment. You can ask your dentist if they advise that you avoid eating or drinking before surgery during your consultation. Make sure you leave your home early so you can be on time for your treatment. By arriving on time, you give your dentist time to prepare for your procedure. You also give yourself time to feel comfortable and relax. Your smile.com.au approved dentist may use one of three types of anaesthesia. It’s important to discuss your options before your procedure. Depending on the complexity of your procedure and your comfort level, your options may include local, sedation or general anaesthesia. After removing your wisdom teeth, you will need pain medication and a cold pack to alleviate swelling. If your dentist has not prescribed you a pain reliever, you can use over-the-counter pain medication. For your convenience, you should have cold packs and pain medication prepared before you have your wisdom teeth removed. Arrange beforehand to take time off from work or school. You may also need to arrange child care or pet care. Have my wisdom teeth caused any damage to the other teeth? Is there a risk that I might experience nerve damage? How many wisdom teeth do I need to have removed? How long will it take to recover fully and return to normal activity? Are there any other treatments I might require after wisdom tooth extraction? What should I avoid immediately after surgery? If your smile.com.au approved dentist intends to prescribe pain relief, you can ask your dentist to let you fill the prescription a day early. By getting your pain medication early, you can avoid a trip to the pharmacy while groggy. While still under the gums, your wisdom tooth can become irritated. The soft tissue sitting over the tooth can accumulate bacteria and food debris before becoming infected. By removing your wisdom teeth, you avoid potential damage to your other teeth. You also avoid other problems associated with wisdom teeth, including cysts, decay, and gum disease. As you age, wisdom teeth removal surgery becomes more difficult and complex, which in turns involves a longer recovery and higher risks. As with every medical procedure, wisdom tooth removals also have disadvantages. Depending on the size, shape and position of your wisdom tooth, removal can range from being a simple extraction to a more complex process. In the case of a simple extraction, you can generally expect little swelling, bruising and bleeding. More complex extractions will often result in more severe bruising, swelling and bleeding. Your smile.com.au approved dentist will provide post-operative care instructions to alleviate any pain or discomfort caused by the procedure. You will likely experience some discomfort after removing your wisdom teeth. Some pain, bleeding, and swelling is also common. While your mouth heals, it is important to be careful to not dislodge the blood clot or harm your gums. You can alleviate swelling with an ice bag or frozen vegetable bag. Your smile.com.au approved dentist will use an anaesthetic during your extraction, so the procedure itself will not hurt. There are many home-remedies available to help alleviate pain caused by a wisdom tooth. These remedies often include using warm salt water, cloves and clove oil, ice, onion, cucumber slices, tea bags, baking soda paste, or peppermint. If you are experiencing pain from your wisdom tooth, your smile.com.au approved dentist will be able to help you find a long term solution. These remedies are short-term fixes and are not appropriate long term methods for managing your wisdom teeth. Cloves (or clove oil) has been used for years to alleviate the pain of toothaches and wisdom teeth. Place a whole clove (not crushed or cut) directly on the spot in your mouth causing the most irritation. Alternatively, you can use clove oil on a cotton ball. It is typically recommended you leave it there until you experience a numbing sensation. This home remedy is popular because it not only numbs the pain but also prevents infection due to its antibacterial and antiseptic qualities. This is one of the easiest remedies for relieving wisdom teeth pain. Simply mix a cup of warm water with a teaspoon of salt. Then, rinse your mouth with warm salt water for one to three minutes before spitting it into the sink. Repeat this process every few hours to start experiencing pain relief. You can also use an over-the-counter pain reliever, such as Ibuprofen, to help alleviate pain. If you are experiencing pain from swelling, you can simply apply an ice bag to the swollen area. This will help relieve pain and reduce the inflammation. You can buy ice bags at your local pharmacy, create your own, or use a bag of frozen vegetables. Frozen or refrigerated cucumber slices can help soothe toothaches and take away some of the pain caused by wisdom teeth. When your wisdom tooth hurts, simply take a cold cucumber slice and place it on the affected area. Tea bags are an effective remedy for swollen gums, thanks to the anti-inflammatory characteristics found in tannic acid. Place a cold tea bag directly over the affected area to reduce swelling and relieve pain. While rare, there are some risks involved with wisdom tooth removal. It is important to contact your smile.com.au approved dentist if you experience difficulty swallowing or breathing, excessive bleeding, fever, or pus in the extraction site. These symptoms may be a sign of an infection, nerve damage or other complications, so it is important to contact your dentist immediately for advice. Although unlikely, there are some other long-term complications associated with wisdom teeth removal, such as dry socket. Problematic wisdom teeth development is extremely common, which is why some people choose to have them removed. Some people do not experience any issues with their wisdom teeth, while others can experience pain, discomfort and infection that can lead to more serious problems. It is recommended that you consult a smile.com.au approved dentist for a professional assessment to determine whether you require wisdom teeth removal or not. If your smile.com.au approved dentist advises that you need to have your wisdom teeth removed, it is best to follow their expert advice before the situation worsens. The alternative to removing wisdom teeth is keeping them. While some people can keep their wisdom teeth, most people do not have that option as delaying removal can cause serious problems. Impacted wisdom teeth can push the surrounding teeth, causing crowding and crooked teeth. An infected wisdom tooth can be a very painful experience for days, even after you have started antibiotics. It’s difficult to keep wisdom teeth completely free of plaque. A build-up of plaque can lead to cavities and even periodontal disease. If cysts form around impacted wisdom teeth, you may experience significant bone damage. Delaying removal can result in the roots of the wisdom tooth growing around a nerve in your jaw. As the nerves then become entwined in the roots of the wisdom teeth, they are more susceptible to damage during the extraction. This can leave you with a long-lasting loss of feeling in your mouth, tongue, and lips. What Happens After A Wisdom Tooth Extraction? How Can I Reduce The Pain of Wisdom Teeth Removal? What Can I Eat After A Wisdom Tooth Extraction? What Should I Avoid After A Wisdom Tooth Removal? What Should I Do Once My Wisdom Teeth Are Finally Removed? Can I Smoke After A Wisdom Tooth Extraction? Can I Drive After Removing My Wisdom Teeth? How Do I Recover After Removing My Wisdom Teeth? If you have been given sedation or general anaesthesia, you will be taken to a recovery room after the procedure. In the case where you have received local anaesthesia, you are given a brief amount of time to recover in the dental chair. You may require to have a friend or relative drive you home. Your smile.com.au approved dentist will advise you if this is necessary prior to your surgery. You may also be prescribed medication to manage the pain. You can reduce the pain of removing your wisdom teeth by following your dentist’s post-operative care instructions. Your smile.com.au approved dentist may also prescribe pain medication, which you can take to manage post-operative pain or discomfort. The most severe pain will occur within six hours of the anaesthetic wearing off. Some patients find that stronger pain medicine makes them nauseous, but this can be minimised by eating before taking medication. You can also apply an ice bag or frozen vegetable bag to your jaw for the first 36 hours to reduce swelling and pain. After your wisdom tooth removal procedure, you should eat soft food for the first four to seven days. Protein-rich foods, such as yoghurt, ice cream and cottage cheese are especially good to eat as they are easy to chew and swallow. Applesauce and fruit smoothies are great at increasing your vitamin intake from fruit, however, you must remember to not use a straw. There are many hearty and filling foods that are also particularly easy to chew, including scrambled eggs, soft fish, finely cut meats, mashed potatoes, oatmeal and thin soups. After your wisdom tooth extraction, your mouth may remain numb for a short period of time, depending on the anaesthetic used. Be mindful not to consume hot foods or drinks while your mouth is still numb. Similarly, it's easier to bite your tongue, cheek or lips during this period, so avoid chewy foods. Spicy foods can increase irritation and delay healing, so it's best to avoid for the first four to seven days. Similarly, hard, crunchy, sticky, or sharp foods should be avoided to prevent gum tissue damage. Foods to avoid may include popcorn with hulls, chips, nuts, seeds, and hard pretzels. For the first 24 hours following your wisdom tooth extraction, you should avoid drinking alcohol, smoking, hot beverages and food, strenuous physical activities, and drinking through a straw. In the first hour after you’ve had your wisdom teeth extracted, it’s important to maintain gentle pressure on the gauze pads, which are placed over the extraction sites. You may be able to remove the pads after one hour to replace the gauze. After this, you should change the gauze as necessary. After the bleeding relents, or slows, you can stop using the gauze pads. There is no need to keep gauze pads in your mouth if you are not actively bleeding. It’s important to exercise care and not disturb the surgical area. You should not rinse vigorously or probe the area, nor should you harshly brush your teeth. During this time, smoking will hinder the healing process and can increase the chance of dry sockets, which can cause severe pain and discomfort. While you should brush your teeth the night of your extraction, you can minimise irritation with gentle strokes. You may be told to avoid brushing, flossing and rinsing for 24 hours. Your smile.com.au approved dentist might recommend that you gently rinse saltwater in your mouth 24 hours after surgery, three times a day. Patients typically spend the first day recovering from the removal on bed rest. Strenuous activity, such as bending or lifting, can hinder the healing process and cause increased swelling, pain, and bleeding. It is often recommended that exercise is avoided for three to four days following wisdom teeth removal. You will experience bleeding after removing your wisdom teeth, often for up to 24 to 48 hours. You can minimise any oozing blood by apply gauze pads and constantly applying gentle pressure. Replace the gauze pads as required every 30 to 45 minutes. If you experience severe and uncontrolled bleeding, try repositioning the gauze pads, sitting upright, using ice bags, and biting on a moistened tea bag to help reduce bleeding. If bleeding persists, contact your smile.com.au approved dentist. It is normal to experience swelling after a wisdom tooth extraction. You can apply ice bags or frozen vegetable bags to the affected area for twenty minutes on and twenty minutes off. Your smile.com.au approved dentist may prescribe medication to alleviate swelling. The swelling will not reach its peak until 2 to 3 days after the extraction. Avoid extremely hot foods and beverages. Similarly, you should not use a straw for the first few days after surgery. Make sure to drink plenty of fluids and start with soft foods like pasta, mashed potatoes, or soup. Nausea and vomiting may occur if you have swallowed blood or because of discomfort, anaesthesia, or strong pain medication. Flat ginger ale and coca cola can help reduce nausea, as can plain crackers. You should not smoke for at least 24 hours after surgery. Smoking hinders healing, promotes bleeding, and increases your risk of complications, including dry socket. Depending on your anaesthesia, you may be able to drive home after removing your wisdom teeth. However, it can take time to regain coordination and alertness after anaesthesia. It is typically recommended that you organise a lift home from the dentist. You can expect to fully recover within one to two weeks after your wisdom tooth removal. Your recovery will depend on the complexity of the procedure and number of wisdom teeth removed. While rare, complications such as dry socket, infection, and incessant bleeding can occur. Your healing process may take longer if you are older and experience a chronic health condition like diabetes or respiratory illness. You can typically resume normal activities the day after your extraction, however, you should avoid strenuous activity. Vigorous activity can result in dislodging the blood clot and hinder the healing process. You should drink lots of water after surgery. Avoid drinking alcoholic, caffeinated, carbonated or hot beverages immediately after the removal. Similarly, it's important to avoid drinking through a straw as this can dislodge the blood clot. Avoid irritating, hot, crunchy, or chewy foods. Your smile.com.au approved dentist may prescribe pain medication to alleviate discomfort. In addition to this, you can also use over-the-counter pain medication. You can use an ice bag or frozen vegetable bag to help reduce swelling. Swelling and bruising typically improves in two or three days. Your smile.com.au approved dentist may advise that after twenty-four hours, you start rinsing with warm salt water every two hours to promote healing. To make the rinse, add one teaspoon of salt to eight ounces of warm water. Some oozing might occur the first day after your wisdom tooth removal. Be gentle around the extraction site to avoid disrupting the blood clot or stitches. Make sure you follow your smile.com.au approved dentist's directions about when to replace the gauze pads. It's important to avoid smoking for at least twenty-four hours after your extraction. If you chew tobacco, avoid using it for at least one week. Tobacco can hinder healing, promote bleeding, and increase the risk of complications, including the condition 'dry socket'. You may receive stitches as part of your wisdom tooth extraction. Your stitches may dissolve in a few weeks or alternatively, you may need to schedule an appointment with your smile.com.au approved dentist to have them taken out.